Select the image, screenshot, or character you want to customize. Go to the Format tab on the ribbon and use any of the following options. Tip: Another way to format an object is to right-click it, then choose Format Picture or Size and Position. Brightness: Click this option to change the brightness of the image. Select one of the preset brightness levels, or click Picture Correction Options to specify an exact value. Contrast: Click this option to adjust the contrast of the image. Select one of the preset contrast levels, or click Picture Correction Options to specify an exact value. Recolor: Click this option to recolor the image with a specific color. Select one of the preset colors, or click More Variations to choose a custom color. You can also make part of your image transparent by choosing Set Transparent Color, then clicking the area (color) that should be transparent. Picture Styles: Preset picture styles are a quick way to change the appearance of an image. Just click one of the thumbnails in the Picture Styles drop-down to apply that style to your image. Picture Shape: Click this option to change the shape of your image. It'll be cropped to the shape you choose. Picture Border: Click this option to apply a border to your image. Select one of the preset colors, or choose More Outline Colors to define a custom color. (Tip: Preset color choices come from your theme colors.) You can also change the border's thickness by clicking Weight, or choose a pattern for the border with the Dashes option. To remove the border, click No Outline. Bring Forward: Click this option to bring the object forward one layer on the slide. To move the object to the top layer of the slide, click the small arrow next to Bring Forward and choose Bring to Front. Send Backward: Click this option to send the object back one layer on the slide. To move the object to the bottom layer of the slide, click the small arrow next to Send Backward and choose Send to Back. Align: Use this option to align the object with the slide or with other objects on the slide. Group: Grouping is a handy feature for moving, resizing, rotating, flipping, or changing other attributes of several objects at the same time. To group objects, hold down your Shift key while selecting two or more objects on the slide, click the Group selector, and choose Group. To ungroup objects, click the Group selector, and choose Ungroup. To regroup objects, click the Group selector, and choose Regroup. Rotate: Click this option to rotate the object. Choose one of the listed values, or choose More Rotation Options to enter a specific rotation value. 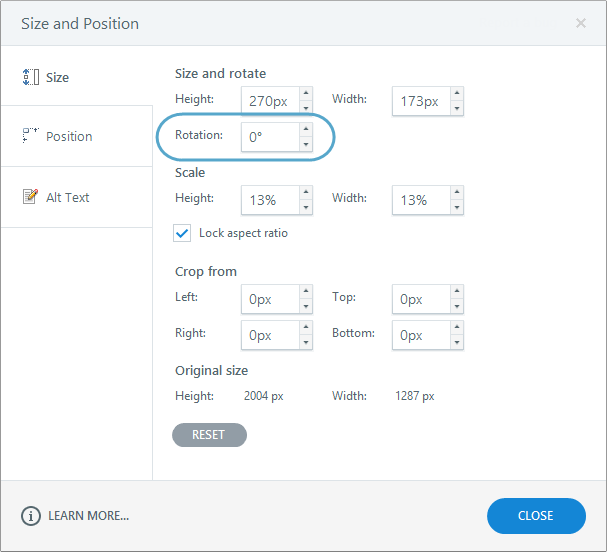 If you choose More Rotation Options, you'll see the following window where you can enter a specific value in the Rotation field or use the arrows to increase or decrease the value. Click Close when you're done. Tip: You can also rotate an object just by dragging its rotation handle. Zoom Picture: When you resize an image in Storyline so that it's smaller than the original, you can add a zoom icon to it, which lets learners see the original (larger) version of the image. For example, if you insert an image that's 500 pixels by 500 pixels and then resize it to be 250 pixels by 250 pixels, the zoom icon lets learners see the image at its original size of 500 pixels by 500 pixels. Crop: Click this option to crop your image. Drag the cropping handles on the image to change its dimensions. To save your changes, either click the Crop button again or click anywhere outside the image.